If there's one thing the fighting game gurus at Capcom love to do, it's team up with other developers. Crossovers have been Capcom's bread and butter for years now, be it through the Marvel vs. Capcom franchise or even less traditional fare like Tatsunoko vs. Capcom. However, it's rare that one of their crossovers gets quite as specific as Street Fighter X Tekken, which teams up their roster of classic Street Fighter characters with those from Namco Bandai's flagship fighting franchise, Tekken, and manages to add in some truly unique features along the way. 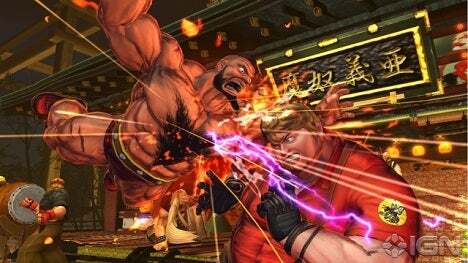 Street Fighter X Tekken combines some of the best elements from each franchise. While the focus is obviously shifted towards Street Fighter for this entry, (there is a planned Tekken X Street Fighter game in development at Namco Bandai which will conversely focus more on Tekken's style of gameplay), the tag system and manual throws are pulled from the Tekken franchise. The resulting experience feels fresh, not owing too much to either side of its parentage. The roster in Street Fighter X Tekken is an even mix of the two franchises. You'll find the familiar favorites from the Street Fighter universe as well as some choice warriors from the Tekken franchise like Yoshimitsu, Heihachi, Jin, Kazuya, King, and Julia. 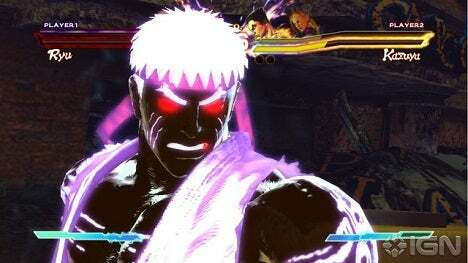 Each character has their own distinct counterpart which will result in unique pre and post-fight dialogue and new story possibilities in the game's Arcade mode. The PS3 version features even more characters, including mascots Mega Man and Pac-Man from Capcom and Namco, respectively, and Cole from infamous representing Sony. Pandora mode is an all or nothing style move that you can pull off at the last possible moment, giving you ten seconds to defeat your opponent. You're only given one fighter from your tag team, but you also have unlimited Cross Gauge as well. If you're on the losing side of a match and both you and your opponent have pretty low health, Pandora mode can be a good way to turn the tide of the battle. However, if your opponent is good and evading your attacks and defending, then you'll find yourself in trouble quickly. Gems are perhaps the biggest addition to Street Fighter X Tekken's fighting formula. Gems add in several specific boosts to your fighters and are divided into two distinct types, Boost Gems and Assist Gems. Boost Gems give you boosts to your attack power, defense, and speed during the course of the match. They activate once certain conditions of the battle have been met, like blocking five times to activate your defense gem or performing five normal attacks to activate your attack boost gem. The other gem type is Assist Gems, which give you passive additions like auto-cancels and auto-blocks, which will automatically trigger at the cost of some of your Cross Gauge. Some conditionally active gems will only kick in when using Pandora mode. You can create your gem loadouts from the menu, and set them up before you start fighting. Since they were initially revealed, Gems have been a huge point of contention for Street Fighter X Tekken's fighting fanbase. Many players worried that introducing the passive assist system would disrupt the game's balance, making so a less skilled player could defeat a more experienced one due to some well-placed gems. To be fair there definitely is that potential in a small number of matches, but it's not nearly as big of an issue as feared, since the gems do a good job of balancing themselves out. As it turns out, gems are actually a great addition to the formula, adding in some great strategy elements and being a lot of fun. Assist Gems almost seem to take more than they give, as losing a piece of your Cross Gauge for a chance auto-block keeps your gauge system in check while your opponent may adeptly be building theirs up. Additionally, there's nothing stopping more advanced players from skillfully creating their own gem set to cater to their specific style of play. Gems don't disrupt the balance of matches, but add in another layer of strategy and factors to consider going in. Street Fighter X Tekken maintains the general look of the recently released Super Street Fighter IV, meaning that Yoshinori Ono-era look with heavily stylized character models and bright, flashy Super Art moves is well intact. It's great to see the wide range of Tekken characters presented in the same comic book vein.